Customer-favorite earstud findings now with additional shapes and designs. 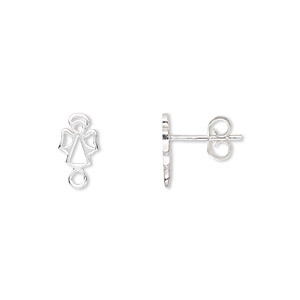 Earstud, sterling silver, 8x6mm angel with cutout design and loop. Sold per pair. 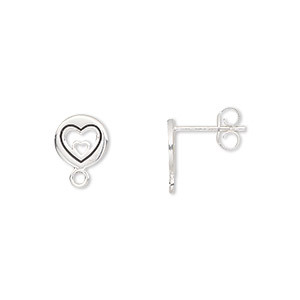 Earstud, enamel and sterling silver, black, 7x6mm heart with paw design and loop. Sold per pair. Earstud, enamel and sterling silver, black, 8mm round with cutout heart and loop. Sold per pair. 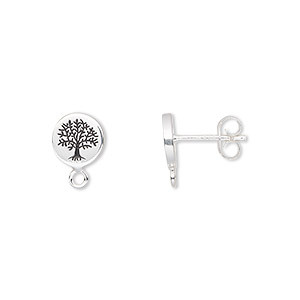 Earstud, enamel and sterling silver, black, 8mm round with tree of life design and loop. Sold per pair. Earstud, enamel and sterling silver, blue, 6.5x6mm flower with loop. Sold per pair.